Currently, Minnesota is the only the state that provides a comprehensive series of USNG maps that cover the entire state. 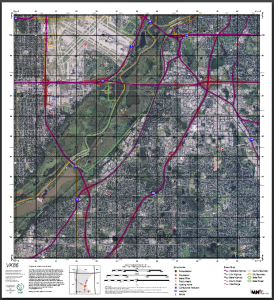 The Minnesota USNG map series, provided by MnGeo, are based on and show the USNG system and include the location of schools, hospitals, fire and police stations, roads and political boundaries over an air photo background. Click on the image below to see an example map Minnesota USNG Map (PDF).